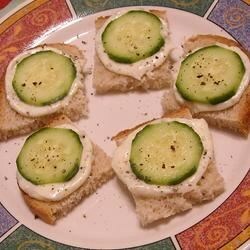 "These little open faced cucumber sandwiches are always a hit, and I never leave a party without getting asked for the recipe several times! Allow the mayonnaise mixture to sit overnight in the refrigerator if you have the time -- it will taste even better." In a medium bowl, thoroughly mix mayonnaise and dry Italian-style salad dressing mix. Arrange the cocktail rye bread slices in a single layer on a serving platter. Place mayonnaise mixture in a pastry bag and squeeze an approximately 1 inch dollop of the mixture onto each cocktail rye bread slice. Top each cocktail rye bread slice with a cucumber slice. I had a large holiday party and served these sandwiches. One small child ate three and the rest sat untouched. Although it is a simple recipe, it is unremarkable. I like to mix in an 8oz block of cream cheese with the mayo and dressing mix to give it a little more glue to hold the cucumber onto the bread. I've made these twice-there have not been any left over. They are really tasty. I didn't peel the cucumber and I added a little more mayo-great. these were amazing!!!!!! served them at a recent party as an informal snack - two trays were gone! they were even great the next morning for breakfast. fabulous. This was the tastiest cuc sandwich I've had. I chopped the cucumber very small, got rid of excess liquid and mixed right in with mayo mix. Excellent!! We had these New Year's Day and we couldn't get enough! These are sooo yummy!